"Hi, in this class I will demonstrate the important 1st part of Alegria de Cadiz, focusing on the Salida del cante (entrance)." 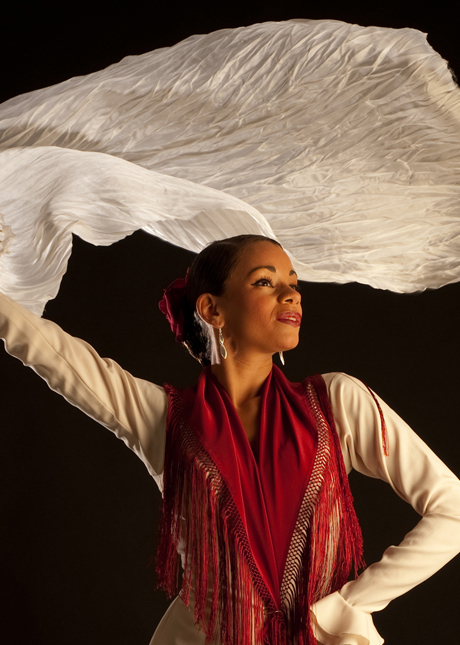 Flamenco dancer and instructor, Saïdjah Galo was born in a musical family. At a very young age, her mother introduced Saïdjah to flamenco in her dance school 'La Zambra' in Bergamo. She learned the basics from Torre Montijo, before taking masterclasses in Northern Italy and Jerez de la Frontera (Spain). She studied with Bélen Maya, Javier Barón, Javier Latorre, La Chiqui de Jerez and Maribel Ramos “Zambra”. After her graduation, Saïdjah moved to Sevilla to master her passion entering the Cristina Heeren Foundation where she takes lessons from Milagros Menjibar "La Reina de La Bata de Cola", Rafael Campallo, Ursula López, Carmen Ledesma, Yolanda Lorenzo, “La Choni”, Luisa Palicio, El Choro and Ely Parillo. In 2008 she performed in the movie ‘Dance the world’ by Marie Jo Lafontaine. With stylish sensuality and elegance, Saïdjah shows a powerful expression of the essence of the traditional flamenco dance.